Chromolaena odorata (L.) R.M. King & H. Rob. (Asteraceae) is a perennial herb, and used in traditional medicine. C. odorata has lead to identification of several compounds especially in the essential oils from various plant parts, and in this article the major compounds are compiled. The biological activities of the various extracts and essential oils are also discussed in brief. C. odorata, Medicinal plant, in vitro, Chemotype. Chromolaena odorata (L.) R.M. King & H. Rob. (Syn: Eupatorium odoratum L.) (Asteraceae) is a perennial herb may reach up to 3 m. The leaves are opposite, deltoid ovate, triangular or lanceolate, achenes with 4 mm long, 4-5 ribbed, bristly on ribs and has many white hairy pappus. This plant is distributed throughout India, tropical Asia and Mexico. This plant is native from Florida through the West Indies and through Central and South America to Argentina [1-3]. The plant exhibited allelopathic effects and has been reported to cause livestock death . Traditionally this plant is used in coughs and colds, treatment of skin diseases, wound healing and as a local antiseptic agent [5,6]. Extensive studies of the C. odorata have lead to identification of several compounds especially in essential oil from various plant parts. In this article, the major essential oil compounds reported from C. odorata over the past few years are compiled. The biological activities of the various extracts and essential oil are also discussed in brief. 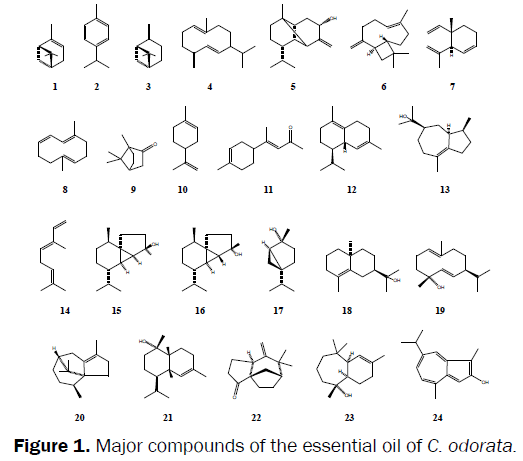 The major chemical compositions of the essential oils of the aerial parts of C. odorata have been reported (Figure 1). α-pinene (1) and p-cymene (2) from Cameroon and Congo from Nigeria α-pinene (1), β-pinene (3), germacrene D (4), β-copaen- 4α-ol (5), β-caryophyllene (6), geijerene (7) and pregeijerene (8), α-pinene (1), camphor (9), limonene (10), and β-caryophyllene (6) from Thailand pregeijerene (8), germacrene D (4), α-pinene (1), β-caryophyllene (6), vestitenone (11), β-pinene (3), δ-cadinene (12), geijerene (7), bulnesol (13), and trans-ocimene (14) from Ivory Coast α-pinene (1), geijerene (7), and pregeijerene (8) from India pregeijerene (8), epi-cubebol (15), cubebol (16) cis-sabinene hydrate (17), 10-epi-γ-eudesmol (18), germacrene-D-4-ol (19), δ-cadinene (12), germacrene D (4), geijerene (7), cyperene (20), α-muurolol (21), and khusimone (22) as the major constituents. The main compounds himachalol (23), 7-isopropyl-1,4-dimethyl-2-azulenol (24), andro encecalinol (25), and 2-methoxy-6-(1- methoxy-2-propenyl) naphthalene (26) have been reported from the roots of C. odorata [7-14]. C. odorata is a medicinal plant having diverse biological activities such as anthelmintic activity at 2.5 mg/ml concentration of extract against adult Pheretima posthuma . Alcoholic (50%) extract of C. odorata was effective against Neisseria gonorrhoeae strains in vitro isolated from symptomatic patients. This plant is popularly used in Guatemala for the treatment of gonorrhoea . The diuretic activity for the infusions of C. odorata was evaluated in albino rats. The extract showed a dose-dependent decrease diuretic effect and justifies the use of this plant as diuretic agent by the Malaysian traditional medicine . Aqueous and methanolic extracts of C. odorata showed significant anti-inflammatory activity in various rat models and justifies the traditional uses of the plant in the treatment of wounds and inflammation [18,19]. Apart of this methanolic extract of C. odorata demonstrated significant antipyretic and antispasmodic activity . The aqueous leaf extract of C. odorata showed wound healing effects in rabbits . The crude extract of C. odorata showed strong antimicrobial effects against Propionibacterium acnes and Staphylococcus epidermidis recognized as pus-forming bacteria triggering an inflammation in acne . Moreover, the essential oil of C. odorata demonstrated antibacterial activity against Staphylococcus aureus and Escherichia coli . The in vitro cytotoxicity bioassays on human cell line HaCaT did not revealed any toxicity of C. odorata essential oil up to 3000 μL/mL . A plant can be considered as a system where many biochemical reactions occur. The secondary metabolites are the product or byproduct of biosynthesis, where several factors alter the synthetic route, including soil, climate, rainfall, altitude, grazing frequency, and amount of sunlight, causing the plant to produce different metabolites. Based on the geoclimatic distribution of the flora, botanicals may be consumed by local residents to cure disease, and some plants are frequently used in food preparation . The quantitative and qualitative divergence may be due to the geographical, climatic, and soil conditions, which in turn may affect the composition and other secondary metabolites of the plants [24-26]. The variation on the secondary metabolites among plants chemotype may occur among sites. The quantitative change in individual or groups of substances, some remain constant, some increase, some decrease, some disappear, or may originate a new constituent . The secondary volatile metabolites of different parts of same plant virtually showed quantitative differences of compounds reported in the essential oil composition from aerial parts flowers and roots of the plant C. odorata (Figure 1). The compositional variation of essential oils of different parts (aerial, flower and root) of similar plant taking consideration of other plants also viz. Anaphalis contorta, Craniotome furcata, Crassocephalum crepidioides, Coleus aromaticus, Tagetes minuta, Ocimum sanctum, Curcuma longa, Artemisia persica, Senecio Belagaviensis, Senecio bombayensis, Prangos ferulacea, Vernonia cinerea and Lantana camara also showed the marked variation in the essential oil content of various individual plant parts [28-47]. Moreover, oil constituent was extremely variable, and individual constituents were not affected by intra plant location of the leaves, plant age, or geographic site . This limits their taxonomic value, but possibly enhances their ecological significance as a defense adaptation to herbivores . Nevertheless, there are an almost uncountable number of single substances and a tremendous variation in the composition of essential oils. Apart from the phytochemical group of substances typical for a taxon, the chemical outfit depends on the specific genotype, the stage of plant development, influence of environmental factors and the part of the plant . This report described that the roots essential oil of C. odorata produced different chemotypes, other than the aerial parts oil. Figure 1. Major compounds of the essential oil of C. odorata. A single plant is used in the treatment of various diseases or as a food supplement can varies phytochemicals as per the geoclimatic distribution. As the development of technologies more efforts are utilized to search of new chemical entities for treatment of the diseases which are safe from adverse effects. Now a day’s various bioactive compounds are investigated from those where the plants are traditionally used for treatment of particular disease. In the future, further phytochemical and biological activities should be carried out on this plant to disclose its active principles not only from essential oils but also from various solvents extracts and mechanism of active constituents. Hajra PK, et al. Flora of India. Botanical Survey of India, Calcutta, India (1995). Howard RA. Flora of the lesser Antilles. Leeward and Windward Islands. Arnold Arboretum, Harvard University, Jamaica Plain (1989). Liogier HA. Descriptive flora of Puerto Rico and adjacent Islands. Editorial de la Universidad de Puerto Rico, San Juan, PR (1997). Zachariades C, et al. Chromolaenaodorata (L.) King and Robinson (Asteraceae). In: Biological control of tropical weeds using Arthropods, In: Muniappan R, Reddy GVP, Raman A (Eds.). Cambridge University Press, UK (2009). Morton JF. Atlas of Medicinal Plants of Middle America, Vol. II. Charles C. Thomas, Publisher, Springfield, Illinois, USA (1981). Adjanohoun E and Ake-Assi L. Contribution au recensement des plantes medicinal de Cote d’Ivoire. Centre National de Floristique, Abidjan, Ivory Coast (1979). Lamaty G, et al. Aromatic plants of tropical central Africa. IV. Essential oils of Eupatorium odoratum from Cameroon and Congo. J Essent Oil Res. 1992;4:101-105. Owolabi MS, et al. Chemical composition and bioactivity of the essential oil of Chromolaenaodorata from Nigeria. Rec Nat Prod. 2010;4:72-78. Inya-Agha SI, et al. Phytochemical and antibacterial studies on the essential oil of Eupatorium odoratum. Pharm Biol. 1987;25: 49-52. Pisutthanan N, et al. Constituents of the essential oil from aerial parts of Chromolaenaodorata from Thailand. Nat Prod Res. 2006;20: 636-640. Bedi G, et al. Composition chimique des huilesessentielles de ChromolaenaodorataL . King Robinson d’Abidjan–Côte d’Ivoire. J Soc Ouest-AfrChim. 2001;11:29-37. Bedi G, et al. Etude des effects anti douleurs des huilesessentielles de Chromolaenaodorata et de MikaniaCordata, par action surla lipoxygenase. Phys Chem News. 2004;15: 124-127. Joshi RK. Chemical composition of the essential oils of aerial parts and flowers of Chromolaenaodorata (L.) R. M. King & H. Rob. from Western Ghats region of North West Karnataka, India. J Essent Oil Bear Pl. 2013;16:71-75. Joshi RK. Chemical composition of the essential oil of Chromolaenaodorata (L.) R. M. King & H. Rob. roots from India. J Chem. 2013: 1-4. Mishra D, et al. Phytochemical investigation and evaluation of anthelmintic activity of extract from leaves of Eupatorium odoratum Linn. Indian J Pharm Educ Res. 2010;44:369-374. Cáceres A, et al. Antigonorrhoeal activity of plants used in Guatemala for the treatment of sexually transmitted diseases. J Ethnopharmacol. 1995;48:85-88. Gopinath R, et al. Diuretic activity of Eupatorium odoratum Linn. J Pharm Res 2: 844-846. Owoyele VB, et al. (2005) Anti-inflammatory activity of aqueous leaf extract of Chromolaenaodorata. Inflammopharmacology. 2009;13:479-484. Taiwo OB, et al. Anti-inflammatory, antipyretic and antispasmodic properties of ChromolaenaOdorata. Pharm Biol. 2000;38:367-370. Biswal PR, et al.Wound healing effect of Eupatorium odoratum Linn, and himax in rabbits. Indian J Indig Med. 1997;19:71-74. Chomnawang MT, et al. Antimicrobial effects of Thai medicinal plants against acne-inducing bacteria. J Ethnopharmacol. 2005;101:330-333. Koba K, et al. Chemical composition and cytotoxic activity of essential oil of Chromolaenaodorata L. growing in Togo. J Essent Oil Bear Pl. 2011;14:423-429. Joshi RK. Angelica (Angelica glauca and A. archangelica) Oils. In: Essential Oils in Food Preservation, Flavour and Safety. In: Preedy VR (Ed.) 1st Edition, Academic Press, London, pp.2015;203-208. Joshi RK, et al. Chemical composition and antimicrobial activity of the essential oil of the leaves of Feroniaelephantum (Rutaceae) from north west Karnataka. Nat Prod Commun. 2011;6:141-143. Joshi RK. Pulegone and menthonechemotypes of Menthaspicata Linn. from Western Ghats region of North West Karnataka, India. Natl Acad Sci Lett. 2013;36:349-352. Joshi RK. 2,4,6-Trimethoxy-styrene new chemotype from the essential oil of Zanthoxylumovalifolium Wight from India. Natl Acad Sci Lett. 2014;37:331-333. Joshi RK. Chemical composition and antimicrobial activity of the essential oil of Plectranthusmollis (Lamiaceae) from Western Ghats Region, Karnataka, India. Rev Biol Trop. 2014;62:423-431. Pande C, et al. Chemical composition of the essential oil of Anaphaliscontorta Hook f. J Essent Oil Res. 2008;20:444-445. Joshi RK. Essential oil of flowers of Anaphaliscontorta, an aromatic and medicinal plant from India. Nat Prod Commun. 2013;8:225-226. Joshi RK and Pande C. Chemical composition of the essential oil of the flowering aerial parts of Craniotomefurcata. Nat Prod Commun. 2008;3:923-924. Joshi RK and Pande C. Phytoconstituents of the essential oil of Craniotomefurcata (Link.) O. Kuntze. J Essent Oil Res. 2009;21:270-271. Zollo PHA, et al. Aromatic plants of tropical Central Africa. XXXVI. Chemical composition of essential oils from seven Cameroonian Crassocephalum species. J Essent Oil Res. 2000;12: 533-536. Joshi RK. Terpene composition of Crassocephalumcrepidioides from Western Ghats region of India. Int J Nat Prod Res. 2011;1:19-22. Joshi RK, et al.Carvacrol rich essential oils of Coleus aromaticus (Benth.) from Western Ghats region of North West Karnataka, India. Adv Environ Biol. 2011;5:1307-1310. Chamorro ER, et al. Chemical composition of essential oil from Tagetesminuta L. leaves and flowers. J Argent Chem Soc. 2008;96:80-86. Joshi RK. Chemical Composition, In Vitro Antimicrobial and Antioxidant Activities of the Essential Oils of OcimumGratissimum, O. Sanctum and their Major Constituents. Indian J Pharm Sci. 2013;75:457-462. Joshi RK and Hoti SL. Chemical composition of the essential oil of Ocimumtenuiflorum L. (Krishna Tulsi) from North West Karnataka, India. Plant Sci Today. 2014;1:99-102. Leela NK, et al. Chemical composition of essential oils of turmeric (Curcuma longa L.). Acta Pharm. 2002;52:137-141. Mirjalili BF, et al. Chemical composition of the essential oil from aerial parts, leaves, flowers and roots of Artemisia persica Boiss. from Iran. J Essent Oil Res. 2006;18:544-547. Joshi RK. Chemical composition of SenecioBelagaviensis from India. Chem Nat Compd. 2012;47:1010-1011. Joshi RK. GC/MS analysis of the essential oil of Seneciobelgaumensis flowers. Nat Prod Commun. 2011;6:1145-1146. Joshi RK. Essential oil of Seneciobombayensis from Western Ghats region of India. Chem Nat Compd. 2014;50:382-383. Joshi RK. Chemical constituents of essential oil of Seneciobombayensis flower. Maejo Int J Sci Technol. 2014;8:161-164. Akbari MT, et al. Chemical composition and antibacterial activity of essential oil from leaves, stems and flowers of Prangosferulacea (L.) Lindl. grown in Iran. Bulg Chem Commun. 2010;42:36-39. Joshi RK. Sesquiterpene rich essential oil of VernoniacinereaLess. from India. S Afr J Bot 2014;95:129-130. Joshi RK. GC/MS Analysis of the Essential Oil of Vernoniacinerea. Nat Prod Commun. 2015;10:1319-1320. Joshi RK. Comparative analysis by GC-MS and in vitro antimicrobial activity of the essential oils of noxious weed (Lantana camara L.) from Western Ghats region of North West Karnataka, India. J Bioly Active Prod Natur. 2012;2:135-143. Kelsey RG, et al. The concentration and composition of big sagebrush essential oils from Oregon. Biochem Syst Ecol. 1983;11:353-360. Rhoades DF. Herbivores: Their Interaction With Secondary Plant Metabolites. In, Rosenthal GA and Janzen DH (Eds), Academic Press, N ew York. (1979). Franz C and Novak J. Sources of essential oils. In: Baser KHC and Buchbauer G (Eds. ), Handbook of Essential Oils Science, Technology, and Applications, CRC Press, New York (2010).